The nation is today celebrating the 48th Victory Day, marking the most precious day when the country was liberated from the Pakistani occupation forces after a nine-month-long bloodstained War of Liberation. Forty-seven years back on December 16 in 1971, Bangladesh was born as an independent country under the leadership of the Father of Nation Bangabandhu Sheikh Mujibur Rahman, and for the supreme sacrifice of three million people and the honour of nearly half a million women. Last year the celebration has reached a new height following the UNESCO’s recognition of Bangabandhu’s historic 7th March Speech as part of the world’s documentary heritage. The UNESCO on October 30 announced the prestigious acknowledgement to one of the world’s most glorious speeches, through which Bangabandhu effectively decelerated the country’s independence in a mammoth public rally at Ramna Racecourse ground (now Suhrawardy Udyan) in Dhaka on March 7, 1971. The speech provided inspiration to the Bengali nation in their quest for freedom and energised freedom fighters for freeing the country through the nine-month War of Liberation. Different socio-political, educational and cultural institutions and organisations have chalked out a series of programmes to celebrate the nation’s glorious victory over the Pakistani occupation force. The government has taken elaborate programmes to celebrate the Day at the national level today. The day started with 31 gun salutes. President Abdul Hamid and Prime Minister Sheikh Hasina paid tributes to the martyrs of the Liberation War by placing wreaths at the National Mausoleum at Savar with the rise of the sun. They are followed by the freedom fighters and their family members, foreign diplomats, leaders of Awami League and different political and social organisations and people from all walks of life. Prime Minister Sheikh Hasina is scheduled to pay tribute to Father of the Nation by placing wreath at the portrait of Bangabandhu in front of Bangabandhu Bhaban at the historic Dhanmondi 32 in the city. Awami League and its associate bodies, different educational institutes and socio-cultural and professional organisations will also pay homage to the supreme leader of the War of Liberation by placing garlands at his portrait. The day is a public holiday. The national flag is being hoisted atop government, semi-government and private offices as well as offices of autonomous bodies across the country. Important buildings and establishments will be illuminated at night. Important roads and road islands have already been decorated with miniature national flags and colourful festoons. President Abdul Hamid and Prime Minister Sheikh Hasina are supposed to issue separate messages on the occasion. National dailies brought out special supplements. The state-owned and private televisions and radios broadcast month- long special programmes highlighting the Liberation War. Different organisations organises discussion and display Liberation War related documentary. Receptions will be hosted to freedom fighters and family members of martyrs at city, district and upazila levels. Special prayers will be offered in mosques and other places of worship, seeking eternal peace of the souls of the martyrs of Liberation War and peace, progress and prosperity of the country. Improved diets will be served in jails, hospitals, orphanages and vagrant homes across the country. Destitute children will be allowed to visit children’s parks and other recreational centres across the country free-of-cost. Marking the Day, Awami League (AL) has organized two-day long programme. National flag is being hoisted at AL central office, Bangabandhu Bhaban and all AL offices across the country with the rise of the sun. Wreaths have been placed at National Mausoleum at Savar in the morning and at the portrait of Bangabandhu in front of Bangabandhu Bhaban at Dhanmondi 32 in the city. AL leaders would offer fateha at the grave of Bangabandhu at Tungipara at 10 am. Special doa and milad mahfil would also be organised. A discussion would be organised at 3 pm on December 17 at Bangabandhu International Conference Center (BICC). Prime Minister Sheikh Hasina will preside over the discussion. Besides, ‘Bijoy-Mancha’ (stage of victory) will be built at upazila and district levels across the country from December 16, where discussion on history of the Liberation War, photo and film exhibition, documentary, songs on liberation war and cultural programmes would be held. Bangladesh missions abroad observes the day through various programmes. The Bangladesh High Commission in London, United Kingdom, has taken elaborate programmes to observe the day in a befitting manner. 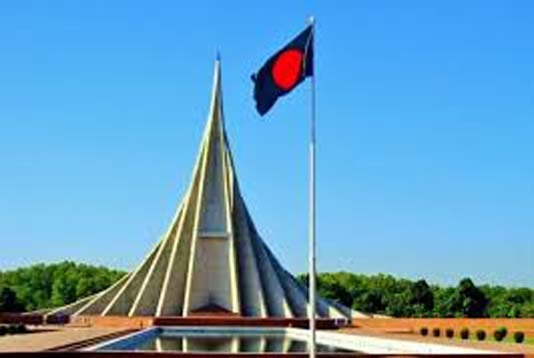 “National flag will be hoisted in the morning, while discussion, cultural programme, photo exhibition on the life of Father of the Nation Bangabandhu Sheikh Mujibur Rahman and War of Liberation will be held in the afternoon. Noted personalities and local Bangladeshis will attend the programme, among others,” Md Ashequn Nabi Chowdhury, press minister at the Bangladesh High Commission in London told BSS yesterday.